Amadeus Mozart, Courtney Love, Andy Warhol were among the luminaries who had autism, a developmental disorder known to appear during the first 3 years which affects the brain’s normal development and communication skills. According to a recent report, 1 in every 68 children is suffering from this disorder, making it one of the dominant neuro disorders. This makes for a growing need of ideas that can help those children deal with autism in an efficient way. As Temple Grandin, aptly remarked, “The thing about being autistic is that you gradually get less and less autistic, because you keep learning, you keep learning how to behave. It’s like being in a play; I’m always in a play.” As it suggests, effective ways of learning will help autism, if done right. 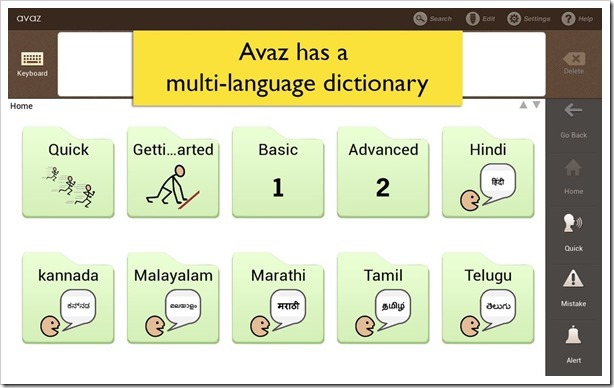 Chennai based startup Invention Labs, headed by Ajit Narayanan, has been doing that for a while now, with Avaz, an iOS and Android app that has been awarded with numerous notable titles across the globe. The app helps autistic kids to learn language and grammar in an interactive visual way. The app is not only popular for English speaking people, it is also fast expanding into the non-English app stores around the world. Notable mentions are Denmark and Italy among others. The app has a free version for iOS as well for trying before parents decide to buy it. Thousands of users from India, US, Denmark, Italy use the app. Narayan has been a TED speaker and holds more than 25 patents in his name. FreeSpeech is another innovative technology built by him (awaiting patent) which is going to be incorporated into Avaz this year. FreeSpeech is built in a way to represent ideas visually by connecting images while expressing them in perfect syntactical sentences in multiple languages. The startup has just secured a $550k seed funding from Mumbai Angels, Inventus Capital, Google India MD Rajan Anandan and Raju Reddy of Sierra Atlantic and a few more. The funding will be used to spread across geographies and dishing out more features for the app. While part of that money goes into core research, most will be targeted towards allowing the challenged kids to learn, communicate and express themselves. Invention labs is set to target other disorders like dyslexia with technology that is also validated by science. It will be great to see, when more of this kind of apps starts getting the proper financial support to prosper. Samsung Reduces Galaxy S5 Price By Rs. 5000!